Kohl was born into a conservative Catholic family in the southwestern city of Ludwigshafen, said BBC.com. He was too young to bear the “taints of Nazism,” but as a teenager during World War II, he helped pull bodies from the rubble after Allied bombing raids—a grim task that shaped his desire for a united, peaceful Europe. 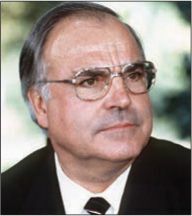 After studying politics and law in college, Kohl quickly ascended the ranks of West Germany’s Christian Democratic Union party. He was elected premier of his home state of Rhineland- Palatinate in 1967 and became West Germany’s chancellor in 1982. Kohl’s “early years in office were marked by gaffes and minor scandals,” said The Wall Street Journal. Most notably, he took President Reagan on a tour of a German war cemetery where 48 members of the Waffen-SS were buried. But he transformed his reputation with his push for reunification. To allay fears that a unified Germany would be too powerful, he pledged to integrate more closely with the precursor to the EU, and even to “surrender the mighty deutsche mark.” In 1990, a year after the Berlin Wall came down, the country reunited.